Now that the Western world’s had a couple of years to get used to games starring Japan’s premiere virtual idol, Sega drops the Hatsune Miku bomb. With over 220 songs to master, Project Diva Future Tone for the PlayStation 4 is one heaping helping of rhythm game goodness. 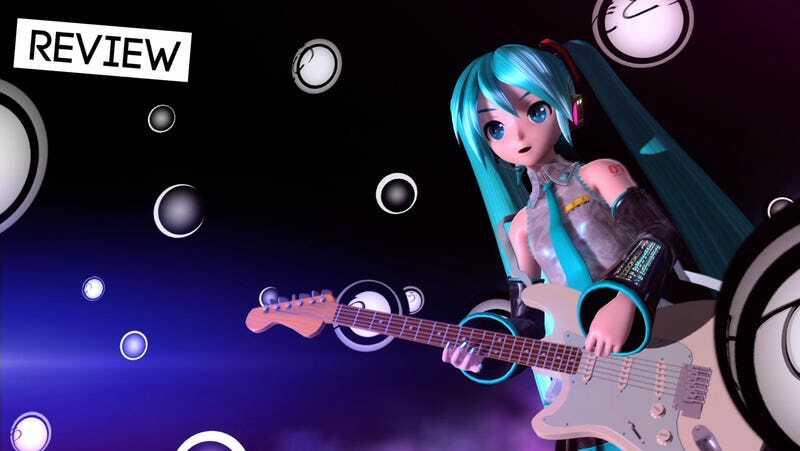 In 2009, Sega brought the breakout star of Crypton Future Media’s Vocaloid singing synthesis software to video game fans with Hatsune Miku: Project Diva for the PlayStation Portable. Combining songs and animations produced by fans utilizing the electronic voices of Miku and friends, Sega created a simple-yet-deep button-tapping rhythm game. Project Diva was ported to Japanese arcades in 2010, where its various iterations have proven wildly popular. Hatsune Miku: Project Diva Future Tone is a PlayStation 4 port of the 2013 arcade sequel. It consists of three different digital releases. There’s a free download called Prelude, which features a pair of songs to try and serves as the base of the game. The bulk of the music comes from the two different song packages available for purchase for $29.99 separately or in a $53.99 bundle, Future Sound and Colorful Tone. Future Sound features 127 songs from the Project Diva series, which means it should feature many songs already familiar to Western audiences. Colorful Tone consists of nearly 100 tracks from the arcade game and Project Mirai series. Together they make up a whole hell of a lot of music. Once you’ve got your songs downloaded, how you play Hatsune Miku: Project Diva Future Tone is up to you. This is an arcade port, so there’s no story structure to follow, no set path. There are a handful of special Survival Courses to tackle, but otherwise the player is free to challenge any songs they want in any order they choose. The massive list can be sorted by difficulty level, name, performer and such. I spent my first 30 minutes with the North American version of the game flagging my favorites for quick access. When I was finished I had a list nearly 30 songs long, which is only a fraction of the music available. Eventually I started to run through the songs alphabetically, marking new favorites as I went. I am currently in the “I”s. Western fans of the Project Diva rhythm game series might find the lack of structure overwhelming. Previous entries in the series gave us progressive lists, completing one song to unlock the next. The most recent game, Project Diva X, was the most structured yet, tasking players with unlocking themed worlds five songs at a time. Comparatively, Project Diva Future Tone is an all-you-can-eat buffet. You’ve just got to pace yourself. Fans of the franchise should be mostly familiar with the gameplay of Future Tone, as it’s just a slight variation on what they’ve been playing on previously released PlayStation games. There are four buttons to press in time with the music—X, O, Up and Left—and each of the four are mapped to both the face and d-pad buttons of the Dual Shock controller. Hold notes are now optional, racking up a bonus as long as they are held, and new slide notes are mapped to either the shoulder buttons or analog sticks. Here’s one of my new favorites in action. There are five difficulty levels to play on, but not all songs are represented in all five. Only 149 songs are available to play in Easy, 216 in Normal and 224 in Hard. Most songs must be beaten in Hard mode to unlock Extreme, and a select few then unlock Extra Extreme. I’m most at home in Hard currently, though I’m slowly working my way into Extreme. I can only imagine Extra Extreme would kill me, so I will never go that far. Hatsune Miku: Project Diva Future Tone is a very arcade experience, built for the rhythm game fan whose main motivation is reaching the highest score with the fewest flubs possible. There are other reasons to play, such as earning Vocaloid Points (VP) and using them to unlock new modules (costumes) for the game’s various characters. There are several hundred to collect, from basic color swaps to special Sega-themed cosplay costumes. I kinda want this hoodie. Yes, with the bare midriff. As much as I love playing dress-up, I’m perfectly content pawing through the massive music archive and playing for score. For my $53.99 there’s no greater feeling that finishing up my favorite song and realizing I hadn’t missed a beat. Hatsune Miku: Project Diva Future Tone doesn’t miss many beats. Though a couple of my more recent favorite Miku tunes didn’t make the cut (notably “Love Song,” featured in last year’s Project Diva X), I am overwhelmed by what Sega’s latest vocaloid rhythm game has to offer.